If airline pilots must log hours on flight simulators annually to be certified to fly, why do surgeons only do their practice directly on people? 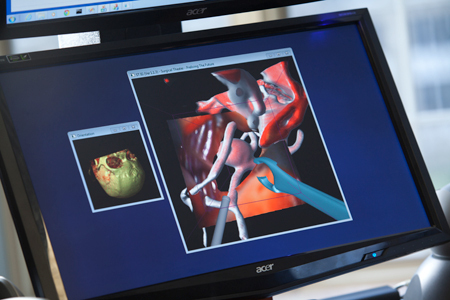 It's the core question at the heart of the medical simulation movement and it's creating an evolution in medical practices worldwide: With better technology at hand, commercial entities as well as clinical subspecialties are now rapidly creating ultra-realistic virtual environments using 3D graphics, audio and haptics so that physicians can better prepare. 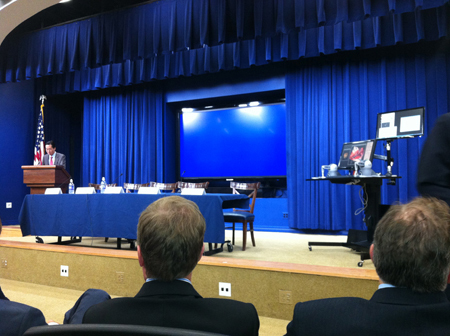 Geomagic customers are leading this initiative: Last Thursday Geomagic OEM partner Surgical Theater LLC of Cleveland OH took center stage at the White House broadband Internet event co-sponsored by US-Ignite and the Executive Office of the President's Office of Science and Technology Policy. Its groundbreaking approach is in using a patient's own CT or MRI scans to create touch-enabled, 3D graphics that surgeons use to visualize the unique anatomy of the patient on whom they'll operate tomorrow. With force-feedback from the Phantom haptic device, surgeons can prepare in advance for tricky circumstances in the surgery. Holding a Phantom™ haptic stylus to operate as if they were holding a surgical instrument, the surgeon can"feel" the virtual tissues, note their reaction to different shaped surgical clips, feel the results of more or less pressure on an aneurysm, and practice different angles of insertion. By providing a true-to-life environment, the surgeon makes critical decisions in advance, on an exact replica of the patient, in a risk free virtual rehearsal environment. The Surgical Rehearsal Platform (SRP) and its use of haptics allows surgeons to learn ways to minimize the time when patient blood vessels are restricted. Surgical Theater will begin a clinical trial of the SRP later this year and is placing units in various medical education institutions' residency programs. 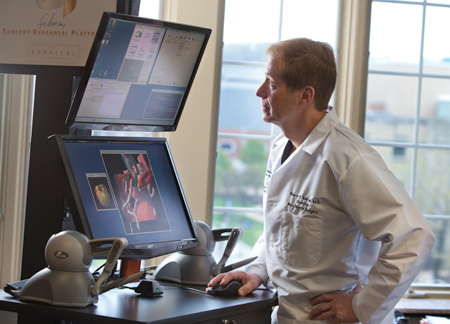 Dr. Sloan is developing additional neurosurgical simulations for the SRP platform, such as the removal of benign and malignant tumors located in critical areas of the brain as well as microvascular decompression, pituitary tumors and acoustic neuroma surgeries. See our press release for more on this exciting product that evolved out of a chance meeting in a coffee shop between two former Israeli defense force simulation developers and a Case Reserve Medical Center neurosurgeon. Their innovation stands poised to change the way surgeons prepare and rehearse for surgery as they"Pre-Live the Future." View Medgadget's latest video of the White House demonstration.